One thing that seems to always be in demand in the NHL is a reliable right-shot defender. 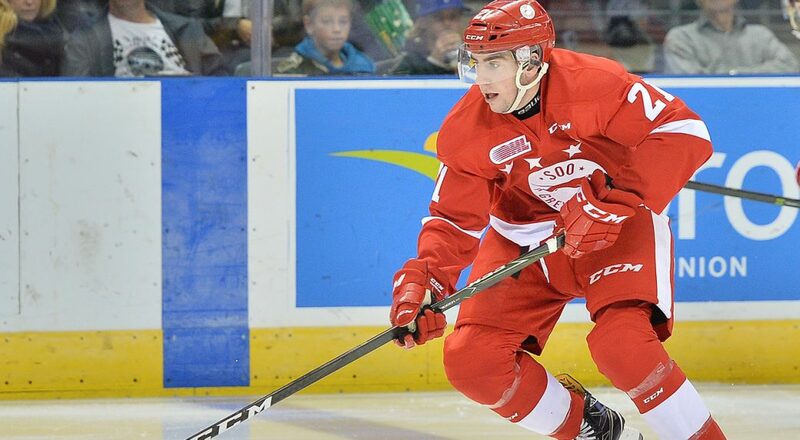 With that in mind, let me introduce you to Conor Timmins of the Sault Ste. Marie Greyhounds. Had he been born three days earlier, Timmins would have been a sixth or seventh round pick in last June’s draft – this year, he’s likely to be selected in the top-45 with an outside chance of climbing into the late first round. Conor Timmins isn’t a name that is brought up all that often when discussing the 2017 NHL draft class – a strange phenomenon when you consider that he’s been among the best player on one of the top CHL teams this season. Timmins has been their best defender and is a big reason why the Soo Greyhounds have been one of the most productive offenses in junior hockey. Consistency is always something that alludes young defenders, so it is a great sign that his head coach views Timmins in this way. He is a well-rounded defender that has significant improvement in his game this season due in large part to improved skating. He plays with a lot of intensity, which helps wins battles in his own end. Timmins is a guy that is probably a little undervalued in this draft class. After putting up only 13 points in his rookie season, he has taken a huge leap forward this year with 43 points in his first 50 games. He currently leads all first-time draft eligible CHL defenders in 5v5 points per game. Timmins is a very smart player. He can see the play developing and shows tremendous control and patience with the puck that you don’t normally see from an 18-year old hockey player – something that makes him an integral part of his team’s breakout. He’s a great passer and shows a poise with the puck that allows him to succeed as the quarterback of the Hounds’ top powerplay unit. While his vision and passing ability have gained him a lot of praise from OHL observers, Timmins should not be viewed as only a puck-moving defenseman. He’s a lot more. He is very good in his own end. Timmins is 6’1, 185lbs but plays a lot bigger. He’s got a physical edge to his game that helps him win battles both on the boards and in front of the net. He reads the play well – a skill that allows him to anticipate passes and close gaps between himself and opponents. The best word to use is ‘disruptive’ – Timmins has a knack for breaking up plays and he’s always making it difficult to create offense when he is on the ice. You really see his intelligence in the way he is able to transition these disruptive plays into a breakout for his team. Some have compared him to Toronto Maple Leafs prospect Travis Dermott, in that both have a very good all-around game, yet have an under the radar draft year because they don’t do anything particularly flashy. Dermott went on to be drafted near the top of the second round and is now likely the Leafs best defensive prospect. If Timmins turns into a right-handed Travis Dermott, he will be a very smart investment for a team drafting in the 25-40 range. With that said, it’s worth noting that those around the hounds think Timmins is a smarter player than Dermott. He is a guy that might not have the physical tools that open the eyes of scouts – he might not ‘look good’ – but Timmins is a player that plays with an intelligence to maximize the tools he does have. He is far more effective than players that might look more polished on the ice. As this season has progressed, he has overtaken Colton White as the team’s best defender and the Soo coaching staff has begun to lean on Timmins more and more, playing him in every situation – how much do they rely on the 18 year old? He’s even taken a few defensive zone faceoffs this season the way Ray Bourque used to in Boston. Timmins has come a long way since being ranked as a ‘C’ prospect by NHL Central Scouting at the start of the season. He likely won’t sneak into the first round – but he likely should. Timmins is a guy that will end up being the top defensive prospect in an NHL organization very soon.